A London event puts music technology, labels, performances, education, and installations under one roof – plus the ‘Serendiptichord’ and music for swimmers. From London, CDM’s roving UK bureau chief and mobile maven Ashley Elsdon of course brings us our preview. Every now and then, an event comes along that really captures my imagination. That could be because of the people involved, it could be because of the technologies that are being shown, or it could be because of the music itself. Rarely do you get a mix of all of these, but We Are Robots seems to be just that. 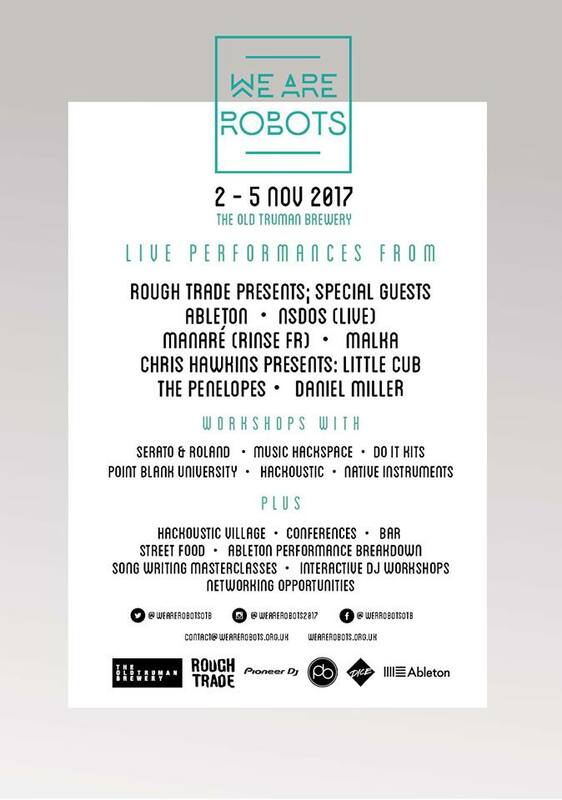 We Are Robots: Future and Innovation of Music is a festival that aims to bring the industry together, which is a big claim. The event itself spans over four days with live performances, label collaborations, interactive workshops, exclusive and never seen before sound installations and more. It’s worth checking out the site to see just how much there is going on because it’s a lot. As part of the event there will be a series of sound installations over the four days. These installations are available for free, and are conceived by a host of sound artists including Yuri Suzuki. There’s creative coder Tim Murray-Browne, the mind behind sonic sculptures including wearable instruments for dancers (‘The Serendiptichord’), a 20 minute score imitating the algorithms of swimmers (‘Music To Swim To’) and a frozen moment of music designed for listeners in space (‘Anamorphic Composition 1’). Meanwhile a groundbreaking student conference on Friday 3rd November, also hosted by Chris Hawkins, will be exploring crucial topics including the future of music education plus artist management and songwriting hosted by Point Blank Academy and more. This is London’s first opportunity and space for tomorrow’s stars to educate and flourish. There are some great companies and organisations taking part too. Some names you’ll know and expect, and others might be new to you or less expected. Here’s a selection from those who are going to be there, Ableton, Arturia, Genelec, Hackoustic, Moog, Music Hackspace, Native Instruments, Pioneer DJ, Point Blank, Rough Trade, and Serato. There’s more besides. So all in all this is going to be something worth visiting. I’m looking forward to, if you’re thinking about going you should check out their site first. It’s also worth checking out the people performing as well.